In Focus Review Atlas Brush Company, Inc. I've covered some high end brushes here at WarGameGuru in the past, and there's more of that to come, but I try to cover a wide spectrum of products overall at WarGameGuru. The way I see it, if a product is useful, even if it isn't the very best option out there, if the price is right it's worth looking at. That's totally the case with Atlas brushes. These guys are so off the radar, that they don't even have a website. It took some detective work on my part just to find the owner, to obtain some of their stuff for the review. However, they're out of Cleveland, OH, they've been around since 1983 making brushes, they are a very small operation of 1-4 people, and annual sales are in the $500.000/1mil ballpark. They're definitely here to stay, and it's clear they've been at this for decades now, and they know what they're doing. Atlas Brush Company, Inc. isn't a huge name in the wargaming/miniatures painting circle. They're not aiming to go head-2-head with Winsor & Newton, DaVinci, etc, either. I'll make that clear from the start, however, through my experience I've found that they do have some products that are quite useful for the price. I was at a local hobby shop one day. 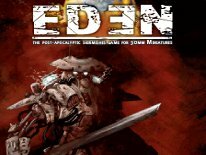 The shop isn't a gaming shop, but they do dabble in Warmachine, GW products, and a few other odds and ends in the way of miniatures, and wargame products. They're mostly a traditional model, and model railroad hobby enthusiast shop. It's the closest place to me if I'm in a pinch for a GW or Warmachine piece, or some hobby tools. If I run out of a specific paint shade, I'll usually pickup a GW shade or two as needed there, since they're my closest option, but not my first choice. Their selection in brushes is pretty slim, as they carry some of the overpriced GamesWorkshop brushes, some really cheap no name brushes, and one day I stumbled upon some Atlas brushes there. In the past I'd pick up one in a pinch, because they never cost more than a few dollars each. In terms of painting, in the past 1.5 years I've painted about 2 rather large 40k armies, 4 or more large Warmachine/Hordes armies, a variety of other miniatures I purchased just because I liked them, and everything I've painted and reviewed here at WarGameGuru. So I'm a little harder on brushes than most people. One in particular that I've used for a good straight 5-months+ at least, is an Atlas #0, Red Sable model #58B, which came in a set of three brushes for under $5. Set No. 58B includes that very same #0, a #5/0 and #10/0, all of which are sable brushes with red handles. Not to be confused with Kolinsky tho, these are still some of the finest inexpensive sable variety brushes I've ever had the chance to use first-hand. While the #0 lasted quite a long time for the price, sadly the #10/0 didn't, but still, for less than $5 for all three brushes, you really can't beat that set. I also painted a lot of eyes with that #10/0, so I feel that I did get my moneys-worth out of it. The #0 still holds a point nicely, and I can still make use of it today as needed. Atlas also make other configurations of the No. 58B set, with different sizes. There's a No 58, No. 58A and 58B as we reviewed. No 58 includes sizes 1/3/5 and 58A includes #5/0, #0 and #2. All of which the MSRP is $4.99 on. I also tried some of their Golden Taklon brushes, which retail for about $2.29 each, and they perform okay too, but won't last nearly as long as the sable variety. I think you'll find that this is pretty much on par with most of the sub-$3 variety of Golden Taklon brushes on the market today too. Golden Taklon just doesn't perform as well as Sable or Kolinsky variety fibers, and Golden Taklon lack the spring and strength of those higher end fibers. They're pretty much in my book, good only for a small one project job, like painting up a 10-man tactical Space Marine squad, or small regiment of any other gaming system figures. I personally have no use for Golden Taklon. I'd rather stick with Sable and Kolinsky. 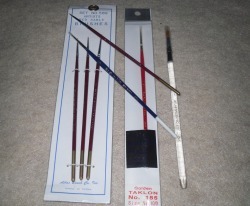 Atlas also offers other Red Sable brushes in various sizes, in their No. 728 line of brushes, which are blue handled brushes offered in singles. These retail for $2.50 each, and I've used these in the past as well, and they seam to work okay, but my experience is that the No 58B variety last longer, and the No. 728 series loose their spring and point a little faster. Still the No .728 for the price isn't bad, so if I had the choice of these, or some other no-name brush, I'd not think twice about it, and just pick up the No. 728. Atlas also makes a wide variety of other synthetic and natural hair brushes too. My experience with most synthetics leads me to believe that there really aren't any stellar synthetics out there, aside from a select few utilizing Toray. Nylon, and the other stuff out there never impressed me. Atlas did sent along a #3 from their 800R series, which utilize clear see through handles for me to look at too. These would be suitable for a child's art project, and other hobbies, and maybe, as a decent brush for washes, but it doesn't hold a point very well brand new, which limits its uses in our hobby. It too costs on average about $2.29 at retail. See a trend here? None of their brushes I've seen to date ever break the $3 mark per brush. 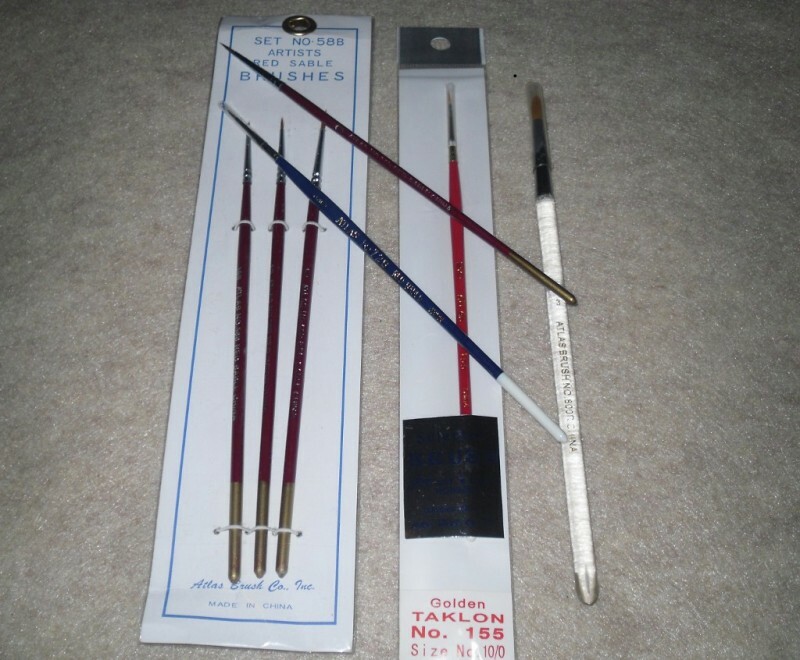 None of these will ever replace a Winsor & Newton Series 7, or most any other Kolinsky brush on the market today, but the Atlas Red Sable No. 58B series is definitely better than most of the synthetic brushes out there, including those from GamesWorkshop, at less than half, or in some cases 2/3 of the price. I really feel that these are the best sable starter brushes out there too, because I see no purpose in shelling out $5+ per brush for better brushes, when someone starting out isn't totally devoted to the hobby yet. New enthusiasts might only paint up their starter box, or a few miniatures, and then call it quits. With a minimal investment for the brushes, this also leaves more money for other miniatures, or game aids too. Chances are, most new bloods will ruin a few of their first brushes anyway, unless they have a good friend who knows better teaching the the ropes every step of the way. Not everyone has this luxury either. I know when I started out I didn't. At any rate, I think the Atlas Red Sable variety No. 58 series is definitely worth looking into. Sure you can spend twice as much, and get a brush that does last 2x-3x longer, but the point I'm making is that when money is tight, and you have only $25 and some change to spend, and the miniature(s) you want cost $19.99, and you need to pay sales tax, and you really could use a detail brush... an Atlas brush isn't at all a bad option to pursue under those circumstances. Three detail brushes for under $5 really is a steal too, as most any other basic Sable fiber brush usually cost at least $3-$5+ each. I doubt Atlas will ever be my #1 choice, but when money is an issue, and I see one sitting there for $2.50, I'm certainly not afraid to pick one up. For the money, they're worth it, and you could spend more on some other no-name brand and be a lot worse off. I should also add that these are better than anything I could ever find at the craft stores like Michaels too. I did some poking around online to price the brushes from Atlas, and I've found the sets from the 58 series for as low as $3.49, and single 728 series brushes for $1.59 each. So they're less than I initially thought, but I paid full retail MSRP price at my local hobby shop too. Atlas caters to the general hobby shop market, so chances are you should be able to find these at most general model, and model railroad hobby shops, more than you would at a gaming shop. Therefore they really shouldn't be too hard to find.